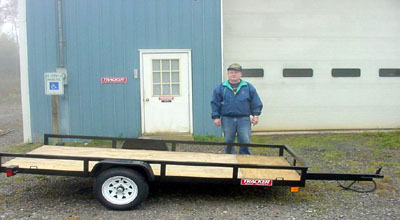 Tracker Built Trailers have been manufacturing the highest quality built trailers for many years in Central Pennsylvania. They also fabricated the guard rail brackets used on the #10 bridge in Clarence. (Take note when passing by on this bridge—these brackets are super sturdy!) Lawrence’s company has been a Corporate Sponsor for Snow Shoe Rails to Trails for 3 years. Lawrence lives across from his business which is located on Rt. 144 between the blinking light in Moshannon and Bob’s Garage. He and his wife Yvonne have 2 boys Brenton, who attends Bald Eagle Area High School and Corey who attends the Mountaintop Elementary.